thank you very much, happy you like it! So peaceful....I can see this on a postcard for sure my dear friend! I liked the tones and light you got. i colori tenui giustificano il tema "peace & tranquility"
this is an image straight from the fairytales/ in looks; and the light looks remarkable! 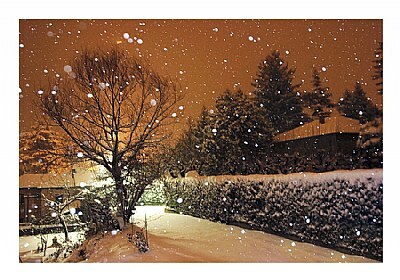 Once again so lovely and magical view from your window dear Roby !!! una gran bella cartolina..quasi un quadro..un caro saluto a te! i like !! regads !!! thanks thanks thanks,, happy you like it, all! wow...the tone is very unique and eyecatching ..
this is truly a wonderful postcard..
from your window, then u r lucky! eggià, bravo...a questa proprio non ci avevo pensato! :)))moh come faccio a levarla...? oh sure, but this one is really dangerous..! arrived here but this year is coming later. great postcard... here we don,t have enough snow this winter... global warming??? oh robert, thank you very much for your support and i'm so happy that you like it! thanks thanks thank you so much wayne..happy you like it! great view from your window. The snow really gives an interesting effect in this image. Beautiful image Roby,very artistic presentation. nice colors and freeze of the snaowflakes. good one, my friend ! .. dimenticavo come si suol dire "è tutta FARINA" del mio sacco.. vedi bene il secondo cognome !!! oh well you are right is a little-big corner, take care txules..
A dreamy image; beautiful tones, lighting, colors, and great atmosphere. Lovely postcard!